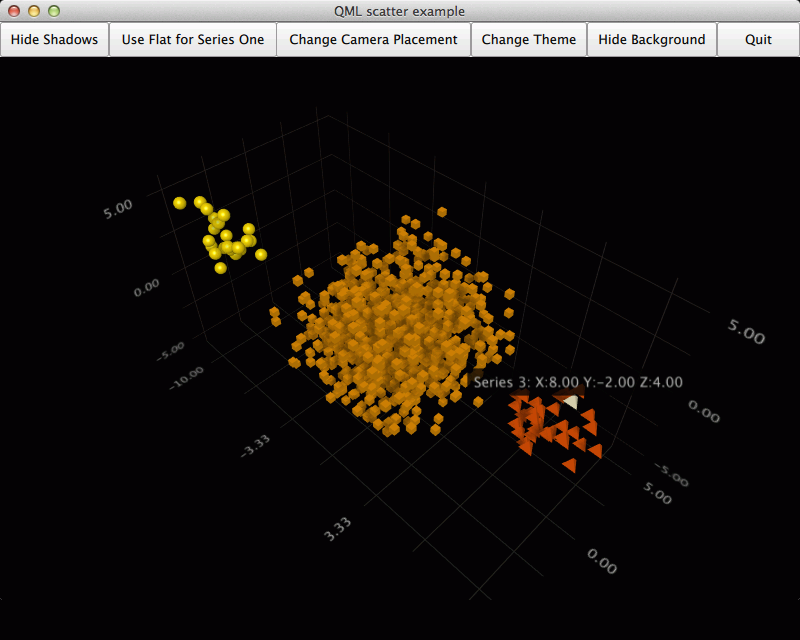 The Qt Quick 2 scatter example shows how to make a simple scatter graph visualization using Scatter3D and Qt Quick 2. For instructions how to create a new Qt Quick 2 application of your own, see Qt Creator help. Before diving into the QML code, let's take a look at the application main.cpp. The last import just imports all the qml files in the same directory as our main.qml, because that's where NewButton.qml and Data.qml are. Now the graph is ready for use, but has no data. It also has the default axes and visual properties. We added a customized theme and changed the shadow quality. We're happy with the other visual properties, so we won't change them. Then it's time to start feeding the graph some data. The seriesData item contains the data models for all three series we use in this example. This is the component that holds our data in Data.qml. It has an Item as the main component. We'll add two more of these for the other two series, and name them dataModelTwo and dataModelThree. itemLabelFormat: "Series 1: X:@xLabel Y:@yLabel Z:@zLabel"
itemLabelFormat: "Series 2: X:@xLabel Y:@yLabel Z:@zLabel"
text: scatterGraph.shadowsSupported ? "Hide Shadows" : "Shadows not supported"